When you’re the boss or if you aspire to be in charge someday, are there any differences in the way you should communicate? When you’re the boss or if you aspire to be in charge someday, are there any differences in the way you should communicate? What should you say and do when everyone wants to connect with you? Let’s talk about how to communicate when you’re the center of attention — or how to communicate like a CEO. First, let me clarify what I mean by “communicate like a CEO.” I don’t mean that you should follow the communication practices of just any CEO. I won’t mention any names, but I think we can all agree there are some bosses you don’t want to emulate! PR expert Rita Linjuan Men, writing for the Institute for Public Relations, describes the characteristics of a great CEO. She explains that the best leaders are ones who inspire trust, loyalty, and dedication. She further notes that one of the best ways to inspire others is through effective communication. In this article I’m going to share how you can learn to communicate as a leader and inspire those around you. For a 2015 article, Glassdoor interviewed 25 top CEOs and asked them to share their communication secrets. Looking at what the CEOs had to say, you can quickly identify some common themes. Business leaders across multiple industries emphasized many of the same characteristics. They also noted that being a CEO comes with added layers of responsibility. A CEO’s words and actions can carry a lot of weight. Plus, instead of just meeting one person at a time, corporate leaders have to meet the expectations of an entire workforce and the public. I read what the Glassdoor’s CEOs had to say and investigated a few others, too. Now I’ll share with you my list of the traits that you can use to communicate like a CEO. Accessible — To inspire a team you have to talk to the team. Great CEOs make time to touch base with their employees and have a genuine open-door policy. Authentic — I’ve mentioned this before, no one likes a fake! Being authentic, even if it allows others to see your flaws, engenders trust. Honest — Speaking of trust, good leadership requires honesty. Lies are like Gremlins (look it up, kids); once they get started they are difficult to control. Empathetic — People respond positively to you when they believe that you are genuinely interested in them. A good way to demonstrate empathy is through active listening. Don’t just nod as your mind wanders. Pay attention to what others are saying and ask questions so that you fully understand their point of view. Engaged — If you want others to follow your lead, you need to demonstrate that you are as invested in the end goal as they are. Discussions about projects and ideas should include active give and take. Confidence — As the leader of a team it is your job to stay calm and carry on. Make sure your words and body language express confidence in your plans. Clarity — CEOs don’t have the luxury of being vague. To set and implement successful plans, objectives must be clearly defined and measurable. Openness — I think the new buzzword for this one is “transparency.” When you are in a leadership position it is important that you demonstrate a willingness to share information. Purpose — The leader of an organization sets its course. To inspire others to follow you requires the ability to communicate a sense of purpose. Your demeanor should demonstrate your faith in both your destination and the directions that you are taking to get there. Enthusiasm — Isn’t it more fun to follow someone if it looks like they are having fun? Even though being a leader is a serious responsibility, it’s OK to smile. If your team or group is working on something that you believe is going to be great — tell them! Whew, that’s quite a list isn’t it? To communicate like a CEO you have to combine a lot of different characteristics. You have to be able to firmly enforce the rules while cheering on your team. Sometimes you have to act as a coach, other times as a counsellor. But in the end communicating like a CEO is similar to communicating like anyone else. Remember TAG? Be thoughtful, authentic, and generous. With those traits, you’re sure to take the lead. If you have any questions, don’t hesitate to ask! 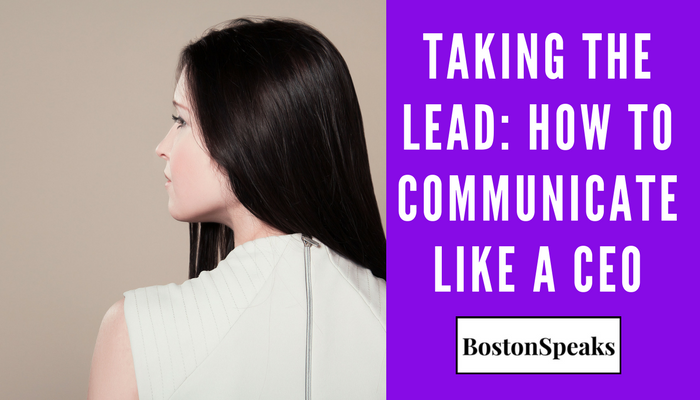 Learn even more about effective communication skills, storytelling and public speaking at theBostonSpeaks Blog or watch one of our weekly BostonSpeaksTalks.